Agatha Award-winning author G. M. Malliet has charmed mystery lovers and cozy fans with her critically acclaimed mysteries. 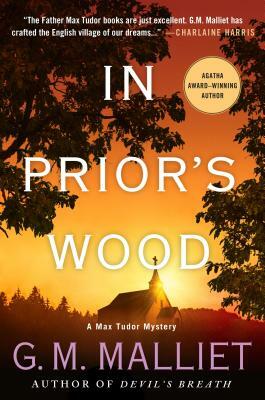 In Prior's Wood, featuring handsome spy-turned-cleric Max Tudor, won’t disappoint. Newly returned from investigating a murder in Monkslip-super-Mare, handsome Max Tudor wants nothing more than to settle back into his predictable routine as vicar of St. Edwold’s Church in the village of Nether Monkslip. But the flow of his sermon on Bathsheba is interrupted when the lady of the local manor house is found in a suicide pact with her young lover. Lady Duxter’s husband rallies quickly from the double tragedy—too quickly, it is murmured in the village. Lord Duxter already has offered his manor house to a motley crew of writers, including Max’s wife Awena, for his writers’ retreat, and he insists the show must go on. When a young girl goes missing and a crime writer becomes a target, DCI Cotton asks Max to lend his MI5 expertise to the investigation. Many suspects emerge as the scope of the investigation widens beyond the writers to villagers who had crossed swords with the insufferably smug crime author. But Max begins to wonder: was the attack on the writer only part of a broader conspiracy of silence? G. M. MALLIET's Death of a Cozy Writer received the Agatha Award for Best First Novel and was named one of the best books of 2008 by Kirkus Reviews. It went on to earn nominations for Anthony, Macavity, and Left Coast Crime awards. The first books in the Max Tudor series—Wicked Autumn, A Fatal Winter, Pagan Spring, and A Demon Summer—also were nominated for the Agatha Award. She and her husband live in Virginia and travel frequently to the UK, the setting for many of her stories.